When you want to pick stunning pieces on bridal jewelry, you need to make your mind on wedding sets you exactly want. These are tried and tested tips on how you can look your stunning best. The wedding jewelry needs to perfectly synchronize with the bridal gown too. Stick to few pieces of wedding jewelry that compliments the best features in you. But do not take the risk of letting your accessories outshine your wedding gown. A wedding band, a pretty looking tiara, a nice wedding necklace and a subtle pick on Rhine-stone based bracelets can work magic on your wedding dress. Plus you pull off the looks revealing the diva in you. 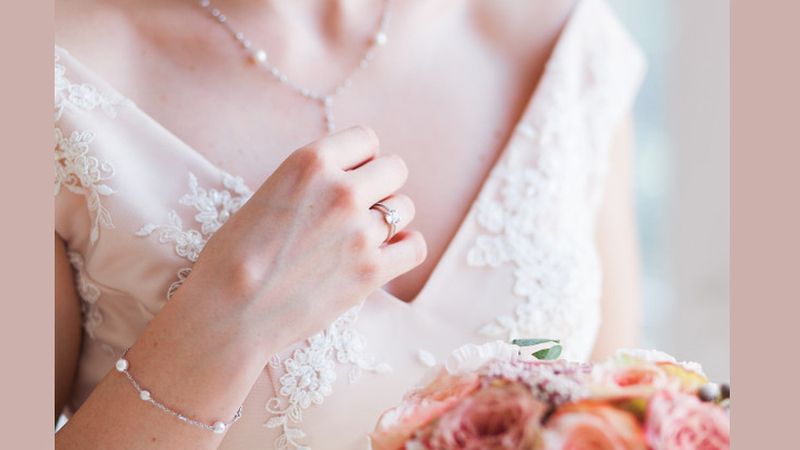 Your bridal jewelry needs to perfectly compliment the color of your gown. This way, the jewelry pieces will perfectly layer and blend with the wedding dress you have in hand. Platinum and silver jewelry goes best with the snow-white gown.Does the color of your gown resemble a creamy ivory shade? Gold jewelry will perfectly set the mood for this kind of an outfit. Does your gown resemble a champagne colored hue? Yellow gold jewelry would precisely complement the costume and set warm tones for a grand wedding party. Do you have the wedding gown in satin pink color? Then rose gold jewelry is definitely the one you should go for. The rose gold metal synchronizes with the satin pink in the most fabulous manner. You can select jewelry pieces in sync with the neckline of the wedding dress. If your wedding dress has a sweet-heart or a strapless neckline, chokers or pendant based necklaces would look super-gorgeous on you. Bracelet bangles and cocktail rings are also must-haves to grace the occasion. For a V-neck style, you can try your hands with delicate pieces on jewelry. You can have the necklaces camouflaged with stud type earrings. Cuff styled bracelets and cocktail rings go best with halter or reverse halter-styled tops. There is simply no hard and fast rule that you must choose jewel sets that completely match your wedding outfits. You can mix and match jewelry and also play with colors. Diamond necklaces and pearl studs can always be chosen if you want to maintain your classic style in place. Above all, try being yourself. You are the center of attraction at your very own wedding day party. It is you who should ideally be calling the shots. If you want heavier necklaces coupled with chandelier styled earrings, simply go for it. If you feel you look terrific in pearl charms, then pearl jewelry is something you can never say a no-no to. Do you want to go for that coveted lariat necklace? If it is a yes, then you can go for it. These are the five practical steps you need to follow if you want to select smashing pieces on bridal jewelry.